It is commonly believed that chaos is linked to non-linearity, however many (even quite natural) linear dynamical systems exhibit chaotic behavior. The study of these systems is a young and remarkably active field of research, which has seen many landmark results over the past two decades. Linear dynamics lies at the crossroads of several areas of mathematics including operator theory, complex analysis, ergodic theory and partial differential equations. At the same time its basic ideas can be easily understood by a wide audience. 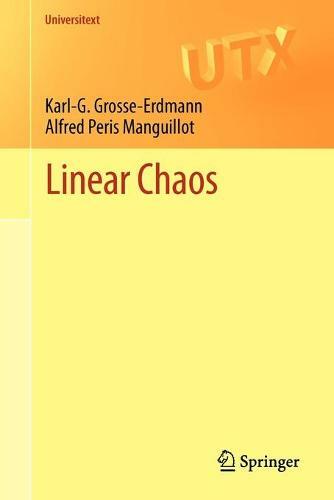 Written by two renowned specialists, Linear Chaos provides a welcome introduction to this theory. Split into two parts, part I presents a self-contained introduction to the dynamics of linear operators, while part II covers selected, largely independent topics from linear dynamics. More than 350 exercises and many illustrations are included, and each chapter contains a further `Sources and Comments' section. The only prerequisites are a familiarity with metric spaces, the basic theory of Hilbert and Banach spaces and fundamentals of complex analysis. More advanced tools, only needed occasionally, are provided in two appendices. A self-contained exposition, this book will be suitable for self-study and will appeal to advanced undergraduate or beginning graduate students. It will also be of use to researchers in other areas of mathematics such as partial differential equations, dynamical systems and ergodic theory.